Housing in the UK is in a critical condition. Itâ€™s not just in one sector; it is quite simply that in any way you might want or be able to house yourself, your choices are narrowing, the odds are lengthening, and thereâ€™s Â fewer places to turn. Here are a few examples of how it might affect you. Canâ€™t afford to rent and eligible for housing benefit? Youâ€™ll have to find somewhere first; housebuilding has dropped but waiting lists have increased. A recent study of housing in the North West revealed a rise of 7% of those on waiting lists with an average wait of 4.8 years, in a region where house prices have more than doubled in 10 years. Changes to housing benefit, especially to Local Housing Allowance (paid to those privately renting) are reducing the possibility of you being able to live in or near city centres. This may mean having to travel a long way to work, moving your child to a different school or potentially being â€“ effectively forcibly – relocated to a different city. Alongside this, under the Governmentâ€™s new â€˜affordable rentâ€™ scheme, â€˜affordableâ€™ means housing association and councils charging social tenants up to 80% of the market rate for rent. In big cities, this is clearly unaffordable for many social tenants. An unemployed man with no history of mental illness committed suicide last year after his housing benefit was reduced, threatening his family with homelessness. Youâ€™re a couple with a child trying to rent privately? If youâ€™re in the capital, hereâ€™s hoping you earn at least Â£52k between you. Thatâ€™s what youâ€™ll need for the average rent of a two-bedroom property in the capital. In eight inner boroughs youâ€™d need Â£60k, even though the average London household income is Â£35k. Â Oh, and youâ€™d best not fall behind on your rent. Private tenancy evictions are up 17% from 2007. Rents are up, and so is unemployment. Demand is also up, because of the lack of provision in other sectors. 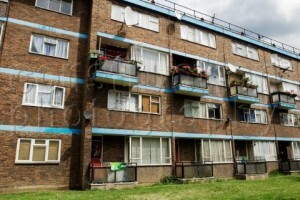 Tenants are therefore more vulnerable to landlordsâ€™ wrath; for example, bad tenants get listed on this lovely site for landlords to vet potential tenants (although youâ€™ll find it quite difficult to do the same for landlords â€“ they donâ€™t have to provide references, see, and negligent landlords are rarely successfully prosecuted). Thinking about squatting in that house thatâ€™s been empty for as long as anyone living nearby can remember? Tough; yesterday, with the help of the Lords, the Government successfully criminalisedÂ the squatting of residential properties. Youâ€™ve got company, at least. There was a 14% rise in homelessness in the last year, to 50,000 households. Â Maybe you could all go and start a tent city like the ones they have in the US. Make sure it doesnâ€™t look like youâ€™re protesting, though! The new anti-squatting legislation (along with a host of other laws) can also be used to stop protestors occupying buildings. Iâ€™m not a housing expert and this is just a snapshot of what Iâ€™ve noticed over the past few months. Even with this glance, itâ€™s a bad picture. The cost of dwellingÂ – by any means – has risen, in some cases sharply. Supply does not relate to demand.Â Weâ€™re in a maelstrom of misinformation and ignorance; for example, the two indices on housing prices used by the Government to decide not only on housing policy but wider fiscal plans have been criticised (both internally and externally) for years for being extremely misleading. Local authorities consistently lie to social housing tenants about their rights. It can be incredibly difficult to find out who owns buildings and land. This is not coincidental. The housing â€˜crisisâ€™ benefits many of those within government and those who lobby them. It doesnâ€™t benefit most people. The housing sector has become increasingly fragmented – campaigners and the rest of us have started to think of housing only in terms of these fragments. But we are now in a period where â€˜the housing crisisâ€™ means a crisis of all housing, a crisis which affects most of us materially and psychologically. This means almost everyone is affected, wherever we live. And it makes sense to think of all of us as â€˜dwellersâ€™ together, since most of us will live in a variety of housing sectors in our lives. There have been calls for a â€˜cross-tenureâ€™ approach to housing activism; this approach would recognise that although we are differently affected and vulnerable, we all want to be able to live where we want and need to, and in doing so to be able to afford other commodities. The criminalisation of squatting has thoroughly convinced me that a cross-tenure, unified approach to housing activism is the only way to go. The state is clearly far more concerned with protecting property ownersâ€™ rights than supporting secure affordable housing for the majority.Â However, the strong focus on property ownership in our housing culture, the huge and differing variety of social housing, and the proliferation of â€˜alternativeâ€™ approaches in the market such as property guardianship are big impediments to us all fighting for proposals which wouldÂ help all of us, whatever our income, be better-housed. â€˜Austerityâ€™ is only part of the problem, and nostalgia isnâ€™t a solution. Housing has always fallen short somewhere, especially for poorer people, but itâ€™s in a particularly bad state now. When the impediments to appropriate housing are as great and as widespread as they are now, opposition to them has to be determined, intersecting and genuinely radical. Great article: very thoughtful on the impact for ‘real’ people, and also on the politics behind this dire situation.